Toy Story is set in a world where toys capable of interacting with each other do no move when there are humans roaming around. The film stars Woody, a cowboy toy who serves as the leaders of the toys under the care of a boy named Andy Davis. Since he and his family are about to move away, Andy celebrates his birthday a week earlier. One of his present include a spaceman action figure called Buzz Lightyear, who immediately moves up the ranks as Andy’s favorite toy. Woody gets jealous of this and the fact the even the other toys seem to be paying more attention to Buzz. However, Buzz clearly thinks of himself as a real space ranger who must find his home planet. It has then become Woody’s goal to convince Buzz that he is just a toy. Before Andy’s family outing at Pizza Planet, Woody attempts to trap Buzz in order to prevent him from being brought along by Andy. However, Buzz accidentally gets thrown out of the window. The other toys witness this and they accuse Andy of being jealous of Buzz. Unable to find Buzz, Andy is left with no option but to take Woody along with him. Before they can leave the house, Buzz also gets in the car and confronts Woody when the car stops at a gas station. Their argument causes them to fall out of the car. Woody fools Buzz into believing that the Pizza Planet delivery truck can bring him to a spaceport. At Pizza Planet, Woody searches for Andy while Buzz gets stuck inside a rocket-shaped game machine. Before Woody can try to save him, Sid Phillips, Andy’s toy-abusing neighbor, comes around and snatches the toys using the game machine’s claw. At Sid’ house, Buzz and Woody try their best to escape before Andy can leave the city for good. As they save themselves from the kid’s dog, Buzz sees another toy of himself and realizes that he is really a toy. He gets confuse and tries to use his wings to prove that he is capable of flying. Meanwhile, Woody does his best to convince Andy’s toys that he’s alive but they do not believe a word that he says. At Sid’s house, the kid has made up his mind to blow Buzz up after a thunderstorm. Woody then decides to do something for Buzz by convincing him that he can make Andy happy. The day after, with the help of Sid’s other toys, Buzz gets saved from Sid by scaring the kid and Buzz leaves the house with Woody before Andy can leave and move with his family to a new house. Before they can get on board the moving truck, Sid’s dog comes after them and manages to get Buzz of the truck. 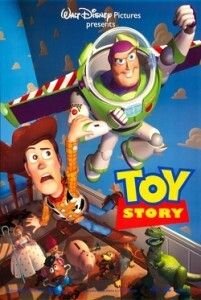 Woody tries to help Buzz but the other toys throws him over thinking that he’s trying to get rid of buzz again. Later on, the rest of Andy’s toys realize that Woody is only trying to help Buzz. They set off on helping the two again but the toy car that the pair is hitching has no more power. At that moment, Buzz uses his rocket to lift the car and guide to the truck. The movie ends with Christmas where the two toys are preparing for the arrival of the new toys that Andy may receive. To their surprise, Andy receives a puppy.